DHS - How would you improve your neighbourhood? How would you improve your neighbourhood? 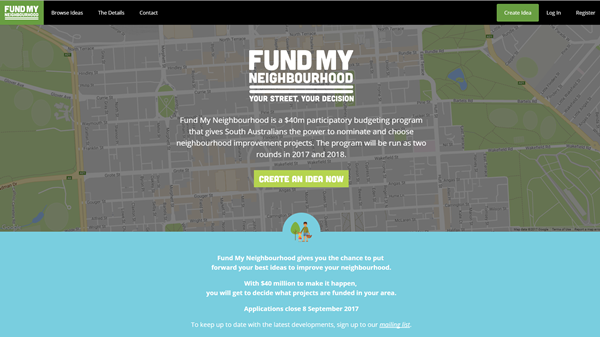 The State Government has launched the $40 million Fund My Neighbourhood program, giving South Australians the power to nominate and choose projects that improve their streets, suburbs and towns. Any South Australian over the age of 18 can submit a project idea, valued at $10,000-$150,000. Ideas can relate to anything that improves their neighbourhood and helps bring communities together, such as neighbourhood centre upgrades, community gardens, street art, playground upgrades, or accessibility improvements. An individual's ideas must be sponsored by an organisation, such as a sporting club, charity, school, community group or non-government organisation, who is eligible to receive the funding. If an individual's idea involves Local Government or State Government-owned or managed lands, the Fund My Neighbourhood team will consult with the relevant councils/agencies. The first round of program funding totals $20 million. A further $20 million will be available in 2018. Applications for the first round of funding close on 8 September 2017.